When you hear the term imagery, you probably think of pictures in your mind’s eye. But an image need not be visual; it can be located in any one of your senses. Imagine a waterfall in front of you. See the sunlight reflected in it, making it glitter like a fluid diamond; feel the pressure created by the water’s force; hear the high and low pitches of a crescendo; taste the water droplets on your lips; smell the pungent, enriched air. The transverse tarsal joint (the midtarsal joint) is composed of the talonavicular and the calcaneocuboid articulations (figure 11.38). Imagine you are wringing a towel while keeping it in a straight line. Visualize the facet of the navicular spinning on the head of the talus. Notice that the medial aspect of the transverse tarsal joint is moving more than the lateral. After twisting one foot, compare the feel and balance of both feet in a standing position. Often muscles seem to be running in discrete lines and directions, with insertions and origins being discernable. Imagine the erector spinae muscles. Lying deep to them are the transversospinalis muscles. Flex your spine and roll down slowly, focusing on the transversospinalis muscles. Roll up again, initiating from the transversospinalis. Dynamic Alignment Through Imagery, Second Edition, presents nearly 500 illustrated exercises—including numerous exercises that are set to music and available on the book’s product page—to help you understand and achieve proper posture and alignment and release excess stress. This new edition includes over 600 illustrations of anatomical imagery and updated chapters with the latest information on dynamic alignment and imagery. Text for introductory exercise, dance, and movement classes and reference for upper-level dance students, dance educators, and somatic education instructors. Resource for instructors of Pilates, yoga, bodyworks, and other groups interested in alignment and imagery. Also a resource for athletes. Eric Franklin is director and founder of the Franklin Institute in Uster, Switzerland. He has more than 35 years' experience as a dancer and choreographer, and he has shared imagery techniques in his teaching since 1986. Franklin has taught extensively throughout the United States and Europe at the Julliard School in New York, the Royal Ballet School in London, the Danish Ballet in Copenhagen, the Dance Academy of Rome, and the Institute for Psychomotor Therapy in Zurich; he was also a guest lecturer at the University of Vienna. He has provided training to Olympic and world-champion athletes and professional dance troupes such as Cirque du Soleil and the Forum de Dance in Monte Carlo. Franklin earned a BFA from New York University's Tisch School of the Arts and a BS from the University of Zurich. He has been on the faculty of the American Dance Festival since 1991. Franklin is coauthor of the bestselling book Breakdance, which received a New York City Public Library Prize in 1984, and author of 100 Ideen für Beweglichkeit and Dance Imagery for Technique and Performance (both books about imagery in dance and movement). He is a member of the International Association of Dance Medicine and Science. 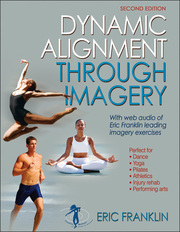 "In Dynamic Alignment Through Imagery, Eric Franklin offers an easy-to-read, practical, and educational resource, which I wholly recommend." "Dynamic Alignment Through Imagery is a must-have resource. Eric Franklin creates a truly powerful tool for improving movement and function."